In January we found ourselves deep in the heart of Texas for the Pléiades 1 – SPOT 6/7 Stadium of the Month, and this month we head to the heart of the Midwest and the site of a crucial late-February Big Ten men’s basketball tilt between the University of Michigan and Michigan State University, i.e. the Crisler Center. 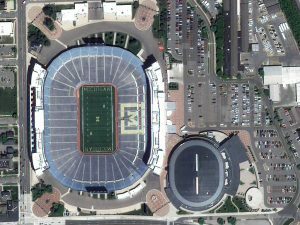 A 50-cm color image of the Crisler Center in Ann Arbor, Michigan, USA collected on May 25, 2018 by Pléiades 1A; and then a 1.5-m SPOT 6 image of the same stadium collected on the previous day, May 24, 2018. These images have custom processing and color balancing applied by Apollo Mapping. PLEIADES © CNES 2019, Distribution Airbus DS. SPOT © Airbus DS 2019. About the Venue: Originally called the Crisler Arena when it opened in 1967 with construction costs of just $7.2 million, the Crisler Center’s name honors University of Michigan sports legend, Herbert O. “Fritz” Crisler, who served as both the football coach and athletic director over his 30 year career. Located on the southern edge of the University of Michigan campus in Ann Arbor, Michigan, “The House that Cazzie Built” started with seating for 13,684 fans and after three rounds of renovations in 1998, 2001 and 2012 the capacity is now 12,707. While we could not find the manufacturer of the wooden floor at the Crisler Center, we did find this detailed handling of wooden sports floor maintenance apparently made by the company that maintains the U of Michigan Maize and Blue floors. Fun Factoids: (1) The Crisler Center is the site of the February 24th NCAA college basketball matchup between the U of Michigan Wolverines and the Michigan State Spartans – a matchup that could help to determine the first place finisher in the Big Ten. Oh and both teams are currently (as of January 16th) ranked in the top 10 of the nation in both the Coaches and the Associated Press Polls, this should be a fun one! (2) The Center is affectionately nicknamed “The House that Cazzie Built” in honor of Cazzie Russell who guided the men’s basketball team to three straight Big Ten championships from 1964 to 1966 as well as two consecutive Final Fours in 1964 and 1965. The Pléiades 1 constellation (or at least part of it!) has been in orbit since December 2011 and if you have not had a chance to check out any sample imagery, take a few moments and have a look at the gallery on our website. If you work with high-resolution imagery, you should consider Pléiades 1 for your next geospatial project. A variety of Pléiades 1 products are available from both a growing archive and as a new collection, including 50-centimeter (cm) pansharpened imagery and 50-cm panchromatic – 2-meter (m) 4-band multispectral bundles. We are happy to discuss the technical specifications, pricing and tasking options available with this satellite constellation. The SPOT medium-resolution constellation consist of seven satellites launched from 1986 to 2014 with the most recent additions, SPOT 6 and SPOT 7, launching in 2012 and 2014 respectively. SPOT 6 and SPOT 7 are twin satellites offering 1.5-m panchromatic and 6-m 4-band multispectral data with a massive footprint at 60-kilometers (km) wide. For projects requiring recent archive coverage or rapid new collections of medium-resolution data, SPOT 6/7 should be one of your top imagery sources! More sample images and technical information about Pléiades 1A and 1B can be found on our website here; while the same can be found here for the SPOT constellation and specifically about SPOT 6/7. The Apollo Mapping sales team can answer any questions you might have about Pléiades 1 and/or any of the SPOT satellites. We can be reached at (303) 993-3863 or sales@apollomapping.com. 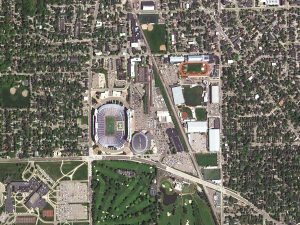 This entry was posted in The Geospatial Times and tagged Pléiades 1 Stadium of the Month, The Geospatial Times, Tips & Tech by Apollo Mapping. Bookmark the permalink.